A 'first annual' "O" exhibition organized by Oasis Magazine in 2010 at the Riyad venture L'Art Pur Foundation Gallery, which houses on the ground floor of The Arts and Skills Institute. Appropriately on glossy paper, for a magazine like Oasis, the A5 size catalogue made sure that the sponsoring companies and functionaries, like PepsiCo's marketing director Farhan Hasan and U.S. ambassador James B. Smith, had their say in the beginning and did not interfere too much with the other pages of the catalogue introducing 28 artists from Saudi Arabia with one or more images of their work and a short biographical paragraph. The magazine describes the artists as 'a modern, progressive and young generation,' with a 'rich cultural heritage.' The ambassador refers to that heritage by naming both calligraphy and a name from Aleppo, that of the Syrian-American classical artist and draughtsman Wabi Al-Hariri. Some of the artists in the catalogue also work with pen or brush in their hands, but many are actually photographers or use digital technology. Here a list of the names and the titles of their work in the catalogue. Eastern Girl. A digital work of a girl holding a mabkhara. Black-White and Urban Decay. Acrylic on canvas and photography. Discusses opposites and greyzones. "Wonderism." Oil on canvas. A colorful portrait of Stevie Wonder. The Man in the Portrait. Acrylias and ink on canvas. Known now for her Mickey Mouses, this painting seems to prefigure the anonymous and universal portrait of men in certain life situations. Sweaty-Far. Ink on paper. Comic book inspired large portrait. Vimto. Acrylic on canvas. Boldly colored images fre popular culture. Frame of Letters and Lyrics Lady. Digital. Calligraphy combined with an image of filmstar Audrey Hepburn. 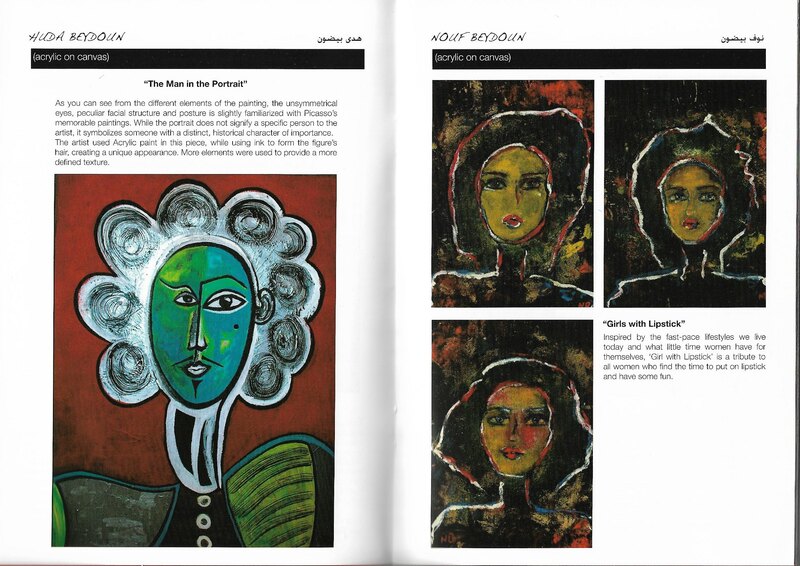 Deviating from all other pages of the catalogue the text for this artist is not in English, but in Arabic. Edit 2 and Jeddah Albalad. Mixed media. Photography based and architecture inspired personal visions. No titles. Photography. Documentary photo's. No titles. Photography. Is sharing with us 'the beauty' of Bahrain. Secret Window. Photography. Concentrating on a detail of a puzzling village window in Turkey. Heart Bokhey II. Photography. Images of light capturing heart scapes in the dark with a very passionate artist statement. Kingdom, Euphoria and Solitude. Photography. Night photos with symbolic meaning attached to them with their titles. Three. Photography. With an interest in sketching too, the artist captured an unpolished moment of sea, sky and man balancing together. Skulls. Photography arranged to explore a concept. Rain. Photography. A diptych showing both the beauty of rain and man running away from it. Untitled. Photography. A detail of nature. Reflection. Photography. Clever image of a landscape reflecting in a large number of raindrops both large and small. No titles. Slow shutter photography. A clear vision and ambition is expressed. Untitled. Photography. An image of most probably old Jeddah. Insanity. Photography. Rapidly turning fair carousel or merry-go-round in the evening. No titles mentioned. Acrylic on canvas. Paintings with a quality reminiscent of literary book illustrations.